Ferrer, J.; Sánchez, X.; Calveras, A.; Paradells, J. Lack of flexibility of current Internet architecture led researchers to come up with new paradigms for a novel Internet architecture, which would be able to reduce complexity and increase flexibility compared to current Internet architecture. Functional co mposition is a promising approach to flexible and evolvable architecture design. The idea is composing complex protocol suites by dynamically bind and arrange different functions to obtain certain behavior. Herein, we present the implementation of a contex t - aware network architecture based on functional composition for smart objects. A sub - set of those basic functional blocks has been implemented and validated on an experimental testbed using different network topologies . Ferrer, J. [et al.]. 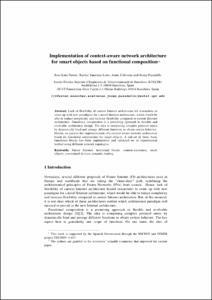 Implementation of context-aware network architecture for smart objects based on functional composition. A: International Conference on Mobile Networks and Management. "Proceedings of the 4th International ICST conference on mobile networks and management". Hamburg: 2012, p. 1-10.